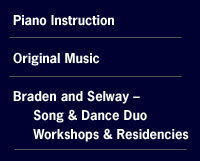 Harnes Selway Arts provides students from the preschool through teen-age years with a creativity-based piano program including private piano and small group classes in theory, improvisation, and repertoire. HSA Piano is based on the teachings of the late Japanese pedagogue, Shinichi Suzuki, who found that children could learn music the same way they learn their native language – through imitation and repetition. Suzuki repertoire books and listening tapes are used in the early grades. HSA Piano materials also include a variety of reading and technique books as the reading of music is stressed right from the start. The Suzuki approach actively involves parents in their child’s music education. The parent attends the child’s music lessons, works with the child during the daily practice sessions in the early grades, and supervises the listening to music tapes.